From Corey Rosenbloom: If you’re keeping track, the market is poised to complete its fourth successful Bull Flag Retracement since reversing higher in November 2016. While it’s an impressive feat, it’s our job to make it profitable as price continues the bullish pathway. 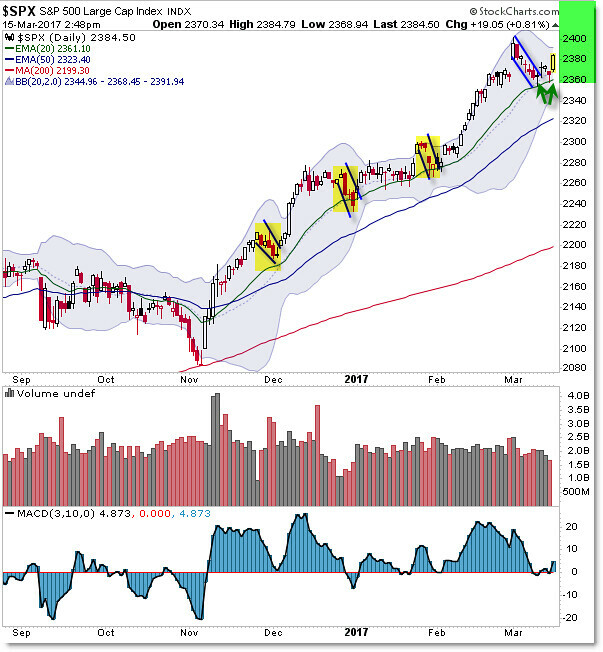 Since November, price touched the rising 200 day SMA and buyers intervened aggressively, reversing the mid-year weakness into late-year impressive strength. From then, three small pullbacks or retracements – tiny Bull Flags – set-up and triggered. We generally buy on a retracement to the rising 20 day EMA in a strong uptrend. For a more detailed method of how we do this, check out our “Perfect Pullback” strategy series. The minimum (smallest) target is a retest of the prior high and the goal is often to hold as long as possible, exiting when price breaks under a rising trendline during the rally. We’re seeing price for a fourth time – this time on a deeper retracement from 2,400 – rally “up away from” the rising 20 day EMA near 2,355 “toward” the 2,400 level or higher. That’s been our plan for members (join us to take advantage of detailed strategies like this as they develop in real-time) and so far the market is “repeating the past” with a successful rally through the bullish pathway. Profits from the strong uptrend abound! The SPDR S&P 500 ETF Trust (NYSE:SPY) rose $0.47 (+0.2%) in premarket trading Thursday. Year-to-date, SPY has gained 6.90%, versus a % rise in the benchmark S&P 500 index during the same period. SPY currently has an ETF Daily News SMART Grade of A (Strong Buy), and is ranked #1 of 107 ETFs in the Large Cap Blend ETFs category.